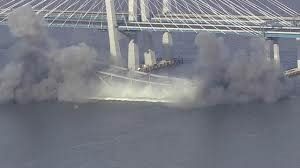 The Tappan Zee Bridge demolition took place as planned. I was personally struck with how the concussion of that blast shook the earth for miles around. For me and for many other local folks, the bridge stood as an admired lifetime symbol and landmark. I was a six year-old “Tarrytowner” when the Tappan Zee Bridge was completed. On the occasion of the explosion, I thought the Sleepy Hollow Lighthouse would make a convenient observation point. There was a group of familiar faces there, poised to watch the collapse of the eastern, remaining structure. At last, there was a loud and violent concussion that shook the ground. As far away as Connecticut, people felt the blast. The event called to mind another powerful detonation which took place in Tarrytown 128 years ago, at virtually the same site. 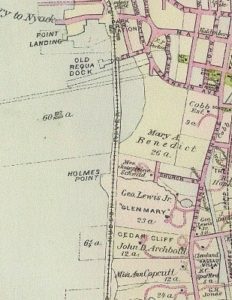 The “Holmes Point Explosion” was the biggest and deadliest industrial accident to ever occur locally. It happened the year after an impressive, new, train station was built at Tarrytown—the station building we all know so well today. On May 19, 1891, the Tarrytown Station was suddenly and horribly turned into an emergency “field hospital.” A work detail of about thirty men, composed mainly of Italian laborers, was riding northward on a flatbed railroad car. On the car with the men was 500 pounds of dynamite (Ajax Powder) and some fuse material. The train was en route to a construction site at Holmes Point (300 yards north of where the Tappan Zee Bridge would stand). A spark from the steam locomotive settled on the explosive and a terrific blast jolted the community. Many of the workers on the flatbed were killed instantly or fatally injured. The railroad bed was littered with bodies and wreckage. A hastily assembled rescue squad brought the dead and injured to the Tarrytown station building, where victims were triaged on the waiting room floor. The capacity of Provident House Hospital in Tarrytown was overwhelmed, and a special train conveyed many victims to Belleview Hospital in New York. A day after the explosion the search continued for bodies in the Hudson River. The explosive involved in the accident was a product of the Rand Drill Company, headquartered on Beekman Avenue in Sleepy Hollow. After the tragedy came an impassioned discussion of where to lay the blame. Who was responsible — the railroad workers, the foremen, or the management? The coroner’s inquest found that all were at fault. Few details have been passed down to us about the “personal costs” of the disaster. In one postscript, the Holmes Point Disaster was to leave an enduring mark on the Tarrytown public school district. The shockwave of the explosion severely damaged the foundation of newly built, Cobb School, at Broadway and Franklin Street. As a result, a larger school building was constructed at the corner of Broadway and Hamilton Place, Tarrytown’s first Washington Irving School.